The shallow waters off the coast of Bali, the dream island in Indonesia, saved those aboard a brand new Boeing 737-800 aircraft to walk away without any fatal injuries or casualties. Upon crash, the aircraft broke into two halves. Initial reports said the aircraft had overshot the runway. 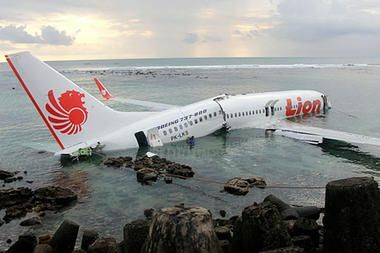 But a Lion Air spokesman, Edward Sirait, told reporters that the plane did not reach the runway, it hit the water first. All 101 passengers, including three foreiengers, and seven crew members aboard a Lion Air flight were rescued Saturday within minutes of the crash. Some 45 people have been taken to local hospitals with injuries, but none seemed life threatening, according to one Indonesian airport official.